Android Market In-app Billing is an Android Market service that provides checkout processing for in-app purchases. To use the service, your application sends a billing request for a specific in-app product. The service then handles all of the checkout details for the transaction, including requesting and validating the form of payment and processing the financial transaction. When the checkout process is complete, the service sends your application the purchase details, such as the order number, the order date and time, and the price paid. At no point does your application have to handle any financial transactions; that role is provided by Android Market's in-app billing service. In-app billing uses an asynchronous message loop to convey billing requests and billing responses between your application and the Android Market server. In practice, your application never directly communicates with the Android Market server (see figure 1). Instead, your application sends billing requests to the Android Market application over interprocess communication (IPC) and receives purchase responses from the Android Market application in the form of asynchronous broadcast intents. Your application does not manage any network connections between itself and the Android Market server or use any special APIs from the Android platform. Some in-app billing implementations may also use a private remote server to deliver content or validate transactions, but a remote server is not required to implement in-app billing. A remote server can be useful if you are selling digital content that needs to be delivered to a user's device, such as media files or photos. You might also use a remote server to store users' transaction history or perform various in-app billing security tasks, such as signature verification. Although you can handle all security-related tasks in your application, performing those tasks on a remote server is recommended because it helps make your application less vulnerable to security attacks. Figure 1. Your application sends and receives billing messages through the Android Market application, which handles all communication with the Android Market server. A Service (named BillingService in the sample application), which processes purchase messages from the application and sends billing requests to Android Market's in-app billing service. A BroadcastReceiver (named BillingReceiver in the sample application), which receives all asynchronous billing responses from the Android Market application. nonce generation. For more information about in-app billing security, see Security controls later in this document. A response Handler (named ResponseHandler in the sample application), which provides application-specific processing of purchase notifications, errors, and other status messages. An observer (named PurchaseObserver in the sample application), which is responsible for sending callbacks to your application so you can update your user interface with purchase information and status. In addition to these components, your application must provide a way to store information about users' purchases and some sort of user interface that lets users select items to purchase. You do not need to provide a checkout user interface. When a user initiates an in-app purchase, the Android Market application presents the checkout user interface to your user. When the user completes the checkout process, your application resumes. 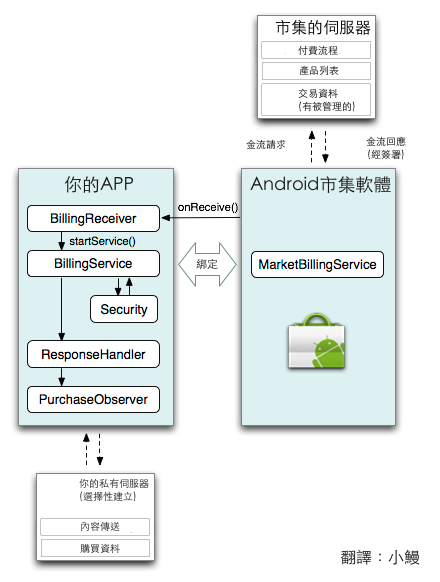 When the user initiates a purchase, your application sends billing messages to Android Market's in-app billing service (named MarketBillingService) using simple IPC method calls. The Android Market application responds to all billing requests synchronously, providing your application with status notifications and other information. The Android Market application also responds to some billing requests asynchronously, providing your application with error messages and detailed transaction information. The following section describes the basic request-response messaging that takes place between your application and the Android Market application. Your application sends in-app billing requests by invoking a single IPC method (sendBillingRequest()), which is exposed by the MarketBillingService interface. This interface is defined in an Android Interface Definition Language file (IMarketBillingService.aidl). You can download this AIDL file with the in-app billing sample application. The sendBillingRequest() method has a single Bundle parameter. The Bundle that you deliver must include several key-value pairs that specify various parameters for the request, such as the type of billing request you are making, the item that is being purchased, and the application that is making the request. For more information about the Bundle keys that are sent with a request, see In-app Billing Service Interface. GET_PURCHASE_INFORMATION This request retrieves the details of a purchase state change. A purchase changes state when a requested purchase is billed successfully or when a user cancels a transaction during checkout. It can also occur when a previous purchase is refunded. Android Market notifies your application when a purchase changes state, so you only need to send this request when there is transaction information to retrieve. CONFIRM_NOTIFICATIONS This request acknowledges that your application received the details of a purchase state change. Android Market sends purchase state change notifications to your application until you confirm that you received them. RESTORE_TRANSACTIONS This request retrieves a user's transaction status for managed purchases. You should send this request only when you need to retrieve a user's transaction status, which is usually only when your application is reinstalled or installed for the first time on a device. Some of these keys are not relevant to every request. For more information, see Messaging sequence later in this document. com.android.vending.billing.RESPONSE_CODE This response contains an Android Market server response code, and is sent after you make an in-app billing request. A server response code can indicate that a billing request was successfully sent to Android Market or it can indicate that some error occurred during a billing request. This response is not used to report any purchase state changes (such as refund or purchase information). For more information about the response codes that are sent with this response, see Server Response Codes for In-app Billing. com.android.vending.billing.IN_APP_NOTIFY This response indicates that a purchase has changed state, which means a purchase succeeded, was canceled, or was refunded. This response contains one or more notification IDs. Each notification ID corresponds to a specific server-side message, and each messages contains information about one or more transactions. After your application receives an IN_APP_NOTIFY broadcast intent, you send a GET_PURCHASE_INFORMATION request with the notification IDs to retrieve message details. com.android.vending.billing.PURCHASE_STATE_CHANGED This response contains detailed information about one or more transactions. The transaction information is contained in a JSON string. The JSON string is signed and the signature is sent to your application along with the JSON string (unencrypted). To help ensure the security of your in-app billing messages, your application can verify the signature of this JSON string. For more information about the fields in this JSON string, see In-app Billing Broadcast Intents. The messaging sequence for a typical purchase request is shown in figure 2. Request types for each sendBillingRequest() method are shown in bold, broadcast intents are shown in italic. For clarity, figure 2 does not show the RESPONSE_CODE broadcast intents that are sent for every request. Your application sends a purchase request (REQUEST_PURCHASE type), specifying a product ID and other parameters. The Android Market application sends your application a Bundle with the following keys: RESPONSE_CODE, PURCHASE_INTENT, and REQUEST_ID. The PURCHASE_INTENT key provides a PendingIntent, which your application uses to start the checkout UI for the given product ID. Your application launches the pending intent, which launches the checkout UI. Note: You must launch the pending intent from an activity context and not an application context. When the checkout flow finishes (that is, the user successfully purchases the item or cancels the purchase), Android Market sends your application a notification message (an IN_APP_NOTIFY broadcast intent). The notification message includes a notification ID, which references the transaction. Your application requests the transaction information by sending a GET_PURCHASE_STATE_CHANGED request, specifying the notification ID for the transaction. The Android Market application sends a Bundle with a RESPONSE_CODE key and a REQUEST_ID key. Android Market sends the transaction information to your application in a PURCHASE_STATE_CHANGED broadcast intent. Your application confirms that you received the transaction information for the given notification ID by sending a confirmation message (CONFIRM_NOTIFICATIONS type), specifying the notification ID for which you received transaction information. The Android Market application sends your application a Bundle with a RESPONSE_CODE key and a REQUEST_ID key. Figure 2. Message sequence for a purchase request. Keep in mind, you must send a confirmation when you receive transaction information from Android Market (step 8 in figure 2). If you don't send a confirmation message, Android Market will continue sending IN_APP_NOTIFY messages for the transactions you have not confirmed. As a best practice, you should not send a CONFIRM_NOTIFICATIONS request for a purchased item until you have delivered the item to the user. This way, if your application crashes or something else prevents your application from delivering the product, your application will still receive an IN_APP_NOTIFY broadcast intent from Android Market indicating that you need to deliver the product. Also, as a best practice, your application must be able to handle IN_APP_NOTIFY messages that contain multiple orders. The messaging sequence for a restore transaction request is shown in figure 3. Request types for each sendBillingRequest() method are shown in bold, broadcast intents are shown in italic. For clarity, figure 3 does not show the RESPONSE_CODE broadcast intents that are sent for every request. Figure 3. Message sequence for a restore transactions request. The request triggers three responses. The first is a Bundle with a RESPONSE_CODE key and a REQUEST_ID key. Next, the Android Market application sends a RESPONSE_CODE broadcast intent, which provides status information or error information about the request. As always, the RESPONSE_CODE message references a specific request ID, so you can determine which request a RESPONSE_CODE message pertains to. The RESTORE_TRANSACTIONS request type also triggers a PURCHASE_STATE_CHANGED broadcast intent, which contains the same type of transaction information that is sent during a purchase request, although you do not need to respond to this intent with a CONFIRM_NOTIFICATIONS message. Note: You should use the RESTORE_TRANSACTIONS request type only when your application is installed for the first time on a device or when your application has been removed from a device and reinstalled. The messaging sequence for checking whether in-app billing is supported is shown in figure 4. The request type for the sendBillingRequest() method is shown in bold. Figure 4. Message sequence for checking whether in-app billing is supported. The synchronous response for a CHECK_BILLING_SUPPORTED request provides a Bundle with a server response code. A RESULT_OK response code indicates that in-app billing is supported; a RESULT_BILLING_UNAVAILABLE response code indicates that in-app billing is unavailable because the API version you specified is unrecognized or the user is not eligible to make in-app purchases (for example, the user resides in a country that does not allow in-app billing). A SERVER_ERROR can also be returned, indicating that there was a problem with the Android Market server. Usually, your application receives an IN_APP_NOTIFY broadcast intent from Android Market in response to a REQUEST_PURCHASE message (see figure 2). The IN_APP_NOTIFY broadcast intent informs your application that the state of a requested purchase has changed. To retrieve the details of that purchase, your application sends a GET_PURCHASE_INFORMATION request. Android Market responds with a PURCHASE_STATE_CHANGED broadcast intent, which contains the details of the purchase state change. Your application then sends a CONFIRM_NOTIFICATIONS message, informing Android Market that you have received the purchase state change information. In some special cases, you may receive multiple IN_APP_NOTIFY messages even though you have confirmed receipt of the purchase information, or you may receive IN_APP_NOTIFY messages for a purchase change even though you never initiated the purchase. Your application must handle both of these special cases. When Android Market receives a CONFIRM_NOTIFICATIONS message for a given PURCHASE_STATE_CHANGED message, it usually stops sending IN_APP_NOTIFY intents for that PURCHASE_STATE_CHANGED message. Sometimes, however, Android Market may send repeated IN_APP_NOTIFY intents for a PURCHASE_STATE_CHANGED message even though your application has sent a CONFIRM_NOTIFICATIONS message. This can occur if a device loses network connectivity while you are sending the CONFIRM_NOTIFICATIONS message. In this case, Android Market might not receive your CONFIRM_NOTIFICATIONS message and it could send multiple IN_APP_NOTIFY messages until it receives acknowledgement that you received the transaction message. Therefore, your application must be able to recognize that the subsequent IN_APP_NOTIFY messages are for a previously processed transaction. You can do this by checking the orderID that's contained in the JSON string because every transaction has a unique orderId. There are two cases where your application may receive IN_APP_NOTIFY broadcast intents even though your application has not sent a REQUEST_PURCHASE message. Figure 5 shows the messaging sequence for both of these cases. Request types for each sendBillingRequest() method are shown in bold, broadcast intents are shown in italic. For clarity, figure 5 does not show the RESPONSE_CODE broadcast intents that are sent for every request. Figure 5. Message sequence for refunds and other unsolicited IN_APP_NOTIFY messages. In the first case, your application may receive an IN_APP_NOTIFY broadcast intent when a user has your application installed on two (or more) devices and the user makes an in-app purchase from one of the devices. In this case, Android Market sends an IN_APP_NOTIFY message to the second device, informing the application that there is a purchase state change. Your application can handle this message the same way it handles the response from an application-initiated REQUEST_PURCHASE message, so that ultimately your application receives a PURCHASE_STATE_CHANGED broadcast intent message that includes information about the item that has been purchased. This applies only to items that have their purchase type set to "managed per user account." In the second case, your application can receive an IN_APP_NOTIFY broadcast intent when Android Market receives a refund notification from Google Checkout. In this case, Android Market sends an IN_APP_NOTIFY message to your application. Your application can handle this message the same way it handles responses from an application-initiated REQUEST_PURCHASE message so that ultimately your application receives a PURCHASE_STATE_CHANGED message that includes information about the item that has been refunded. The refund information is included in the JSON string that accompanies the PURCHASE_STATE_CHANGED broadcast intent. Also, the purchaseState field in the JSON string is set to 2. To help ensure the integrity of the transaction information that is sent to your application, Android Market signs the JSON string that is contained in the PURCHASE_STATE_CHANGED broadcast intent. Android Market uses the private key that is associated with your publisher account to create this signature. The publisher site generates an RSA key pair for each publisher account. You can find the public key portion of this key pair on your account's profile page. It is the same public key that is used with Android Market licensing. When Android Market signs a billing response, it includes the signed JSON string (unencrypted) and the signature. When your application receives this signed response you can use the public key portion of your RSA key pair to verify the signature. By performing signature verification you can help detect responses that have been tampered with or that have been spoofed. You can perform this signature verification step in your application; however, if your application connects to a secure remote server then we recommend that you perform the signature verification on that server. In-app billing also uses nonces (a random number used once) to help verify the integrity of the purchase information that's returned from Android Market. Your application must generate a nonce and send it with a GET_PURCHASE_INFORMATION request and a RESTORE_TRANSACTIONS request. When Android Market receives the request, it adds the nonce to the JSON string that contains the transaction information. The JSON string is then signed and returned to your application. When your application receives the JSON string, you need to verify the nonce as well as the signature of the JSON string. For more information about best practices for security and design, see Security and Design. Before you get started with in-app billing, be sure to review the following requirements and limitations. In-app billing can be implemented only in applications that you publish through Android Market. You must have a Google Checkout Merchant account to use Android Market In-app Billing. If your device is running Android 3.0, in-app billing requires version 5.0.12 (or higher) of the MyApps application. If your device is running any other version of Android, in-app billing requires version 2.3.4 (or higher) of the Android Market application. An application can use in-app billing only if the device is running Android 1.6 (API level 4) or higher. You can use in-app billing to sell only digital content. You cannot use in-app billing to sell physical goods, personal services, or anything that requires physical delivery. Android Market does not provide any form of content delivery. You are responsible for delivering the digital content that you sell in your applications. You cannot implement in-app billing on a device that never connects to the network. To complete in-app purchase requests, a device must be able to access the Android Market server over the network. For more information about in-app billing requirements, see In-App Billing Availability and Policies.